Troglodytes leucophrys Tschudi 1844, Montaña del Vitoc, Junín, Peru. 18 subspecies recognized. English: Highland wood wren; French: Troglodyte a poitrine gris; German: Einsiedlerzaunkonig; Spanish: Saltapared-selvatico Pechigris. plumage; juvenile is similar to adults but with the facial pattern less well-defined. There is considerable variation in plumage between different subspecies. 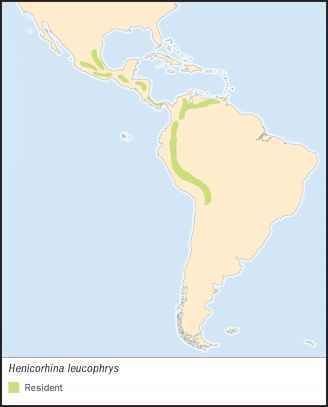 Disjunct distribution in highlands of Central and South America, separated by unsuitable lowland areas, from central to southern Mexico through Guatemala, Honduras, Nicaragua, Costa Rica, and Panama; Andes and adjacent mountain ranges from northern and central Venezuela through Colombia south to central Bolivia. Humid mountain forests, usually above 4,900 ft (1,500 m) but rarely as low as 1,300 ft (400 m), up to 12,500 ft (3,800 m). Occupies several different forest types, including mixed oak and pine woodland, bamboo thickets, and second growth, up to the lower edge of páramo (high altitude heathland). Territorial; lives in pairs or family groups. Is very secretive and usually keeps to lower levels of vegetation. Song is a magnificent series of loud ringing whistled phrases, uttered by both sexes in duet. Roosts in pairs or family groups, in nests built for that purpose. 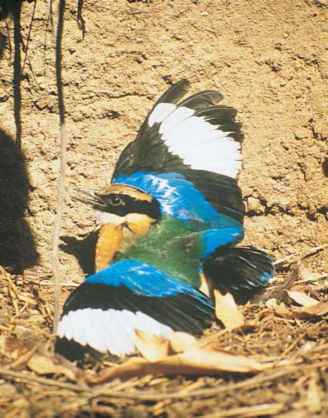 Form of roosting nest is identical to that of breeding nest. Feeds in lower levels of dense vegetation, actively moving around and probing into leaf-litter and tangles. Diet apparently entirely invertebrate; no evidence that any vegetable matter is taken. Nest, built of roots, plant fibers, and moss, is a globular structure with an antechamber leading to a rounded chamber, placed in low vegetation including bamboo thickets. Both sexes build the nest. Eggs number two and are immaculate white. Incubation is by the female only, for 19-20 days. Young are fed by both sexes for 17-18 days. Breeding season depends on geographic location. In Costa Rica breeding occurs late March to early June, in Colombia December to June. Probably multiple-brooded. Not threatened. Much habitat has been lost to agriculture and logging, but large areas remain; some are protected by reserve status.